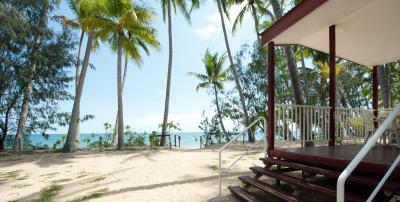 Lock in a great price for Ellis Beach Oceanfront Bungalows – rated 8.5 by recent guests! We had a ocean front bungalow for three nights and it was magnificent. 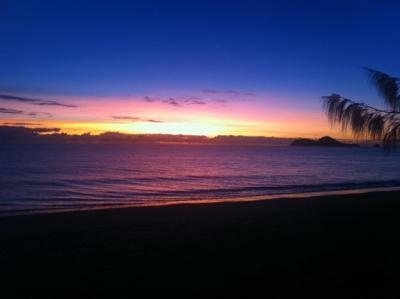 We watched the sun rise each day. 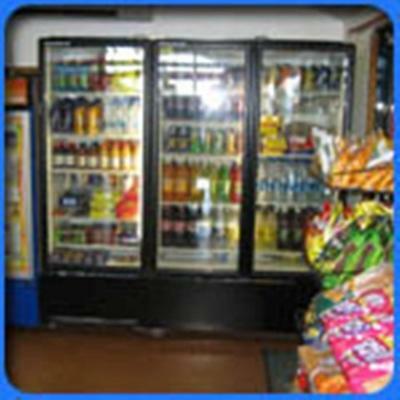 Facilities were excellent and everything we needed for meal preparation was available. 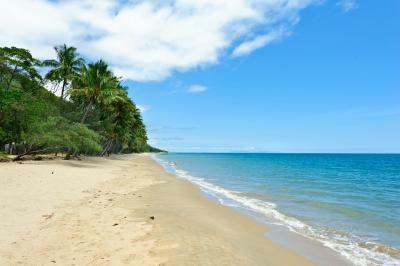 Great location, cute bungalow right on the beach ! This place is awesome if you are forced into some R&R on the beach! The beach is stunning and the units really are beach front. I loved lying in bed at night listening to the sea. 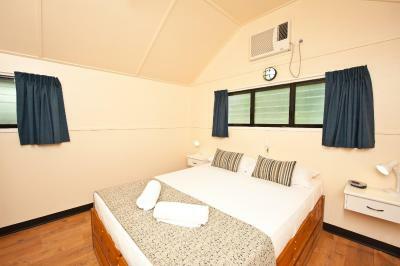 The unit was fabulous with plenty of space, good air con and was very clean. I am definitely visiting again. Thank you Nicole for upgrading us to a deluxe unit, really made our stay better. When it said ocean front I didn’t think I’d be that close it was awesome. 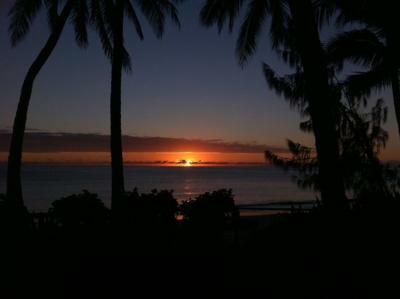 Under normal circumstances, $190/night is beyond my budget and kind of crazy for a caravan park, but given the literally PERFECT location (10 steps to perfect sand, another 20 steps to the ocean, set under palm trees), it was easily forgiven. The cottage was ageing and there were no frills, but it had a great deck straight off the beach and was a throw back to backpacking in tropical countries. 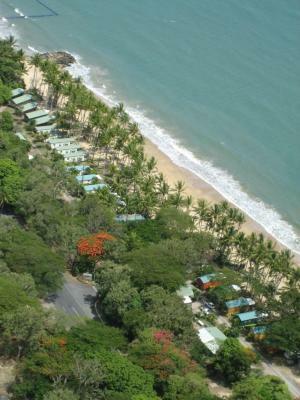 Ellis Beach Oceanfront Bungalows This rating is a reflection of how the property compares to the industry standard when it comes to price, facilities and services available. It's based on a self-evaluation by the property. Use this rating to help choose your stay! Located on a 3.1 mi strip golden sand, Ellis Beach Oceanfront Bungalows features a swimming pool, children’s pool and restaurant. 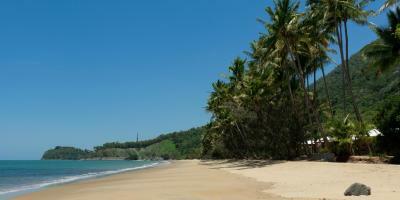 Each self-catering bungalow has direct beach access. Located halfway between Cairns and Port Douglas, Ellis Beach Bungalows are 3.1 mi from Palm Cove and 19 mi from Cairns Airport. 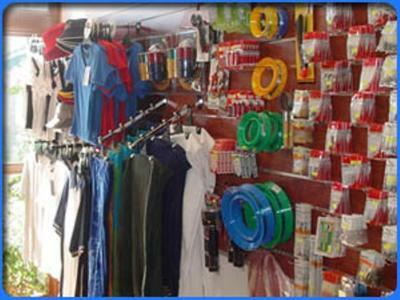 Clifton Beach shopping center is a 10-minute drive away. 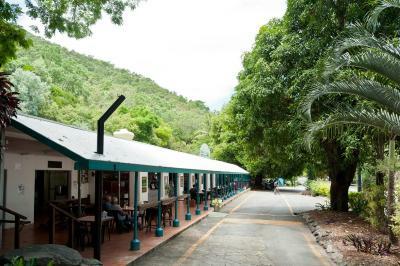 These spacious bungalows are located directly on the beach and include a kitchenette, air conditioning, flat-screen TV, and a private patio with outdoor seating. 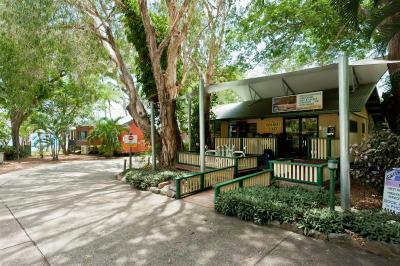 Guests have access to self-service laundry facilities and coin-operated BBQs with covered seating area. Free on-site parking is provided. 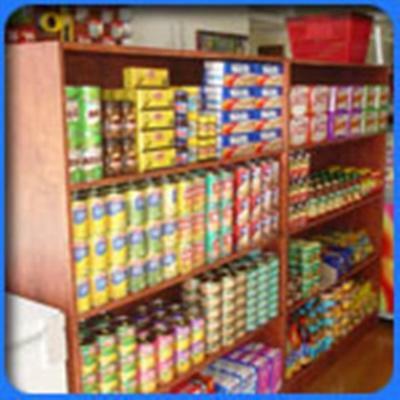 The general store and souvenir shop is open every day. 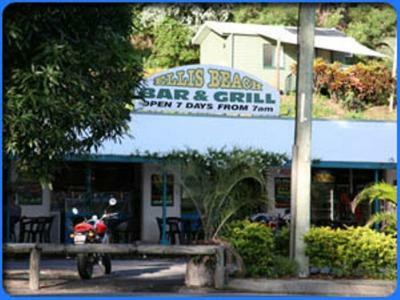 Ellis Bar and Grill serves international cuisine, such as burgers and pizzas. 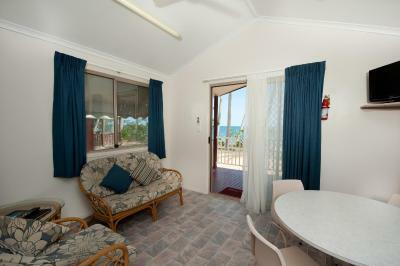 Located across the street from the bungalows, it offers ocean views at breakfast, lunch and dinner. 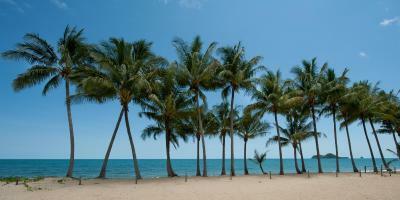 This property also has one of the top-rated locations in Palm Cove! Guests are happier about it compared to other properties in the area. 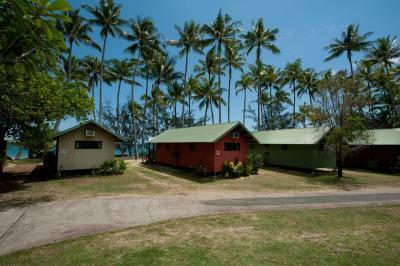 When would you like to stay at Ellis Beach Oceanfront Bungalows? 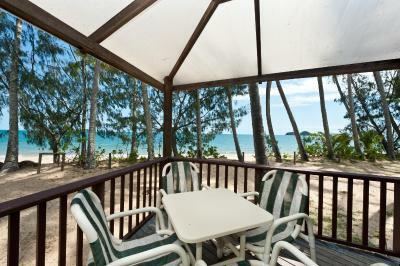 Features a private bathroom, air conditioning, ceiling fans, full-size fridge/freezer, microwave, and a veranda with outdoor seating overlooking the Coral Sea. WiFi is available in public areas and charges apply. House Rules Ellis Beach Oceanfront Bungalows takes special requests – add in the next step! 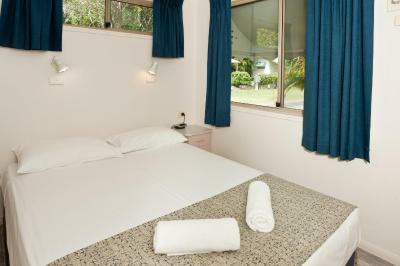 Up to two children under 16 years are charged AUD 30 per night when using existing beds. Ellis Beach Oceanfront Bungalows accepts these cards and reserves the right to temporarily hold an amount prior to arrival. Please note that bungalows are serviced by housekeeping on a weekly basis. Please note that a 3.5% surcharge applies for payments with American Express credit card. Please note that a 4% surcharge applies for payments with Diners Club credit card. It was a little stuffy with the windows closed when arriving but its understandable due to potential wet weather. Location Location Location! Absolutely awesome. Air conditioners a bit noisy. Maybe some split systems would be an advantage. We were in bungalow no. 6. No air con in the small second bedroom, so a bit stuffy. Location is great. Pool is also great. Although a clean cabin, it's in need of renovating. I know it’s trivial but I really don’t like box air conditioner units cause temperature control is difficult and they’re loud as... but I wasn’t hot. 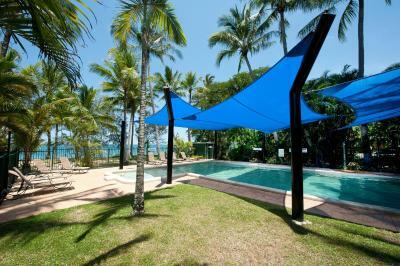 close to beach and a restaurant and pool. The basic nature of the cottage meant that the high nightly rate was solely taking advantage of the location. There was a tiny tv, ageing conveniences and random furnishings. Very close to the coastal highway, but not too noisy. 2nd bedroom was locked. Didn't need it for the bed but as the bungalows are very small, it would've been nice to store our bags in there. No hand towel? The value for money is perhaps compromised by the tired decor/furniture in the cabin. We had number 4 which Ibelieve to be an older cabin.somecabins closer to the park’s reception appear to have much newer interiors & are very nice. We were in number 4 & it was in need of a makeover... albeit basically cosmetic but nevertheless it did need an update. 10/10 forlocation & beach access. Bit over rated to describe the bungalows as luxurious, ertainly No 4 isn:t !,!